Motown was positively awash with new signings at the start of 1963, and with new female solo acts in particular. Many of them had just one or two singles released, and were never heard from again. Vocalist and would-be pro swimmer Agatha Weston, a former member of the Wright Specials gospel group (though not featured on their previous Motown single, That’s What He Is To Me), who pitched up at Hitsville in 1962 to demo some songs a friend had written to Eddie Holland, and instead found herself signed up as an artist and rechristened “Kim” for ease of pronunciation, bucked that trend and released no less than ten singles, either alone or in duets with Marvin Gaye, becoming in the process a much-beloved Motown artist. (She also ended up marrying label A&R director William “Mickey” Stevenson, one of this song’s writers, decamping with him to MGM in the mid-Sixties). For her début release, It Should Have Been Me – listed (incorrectly, according to The Complete Motown Singles: Volume 3) in many discographies as the B-side – Weston was teamed with young writer/producer Norman Whitfield, later a key figure in the Motown Story, who’d co-written a fine song for the purpose, but apparently found it difficult to harness Kim’s young, untrained contralto voice once she was in the booth. Indeed, Kim does seem to struggle a little, especially at the start; her voice is already big, deep and impassioned, bearing all the hallmarks of her massive later performances, but it’s still rather rough around the edges here, as though she can’t quite scale things back when the song calls for it. (Also, even though she was actually in her early twenties when it was recorded, she sounds slightly young to be singing these lyrics, but that’s by the by). But then, colouring inside the lines was never what Kim Weston was about. No. Kim Weston is about standing well back and still being floored by sheer force of expression, beauty, power, the whole package. When the song really kicks up in intensity, she’s absolutely in her element; warming up as the record progresses, she settles into her lead role in thoroughly riveting fashion. Over time, her future husband and her other producers and writers at Motown would learn to provide her with material appropriate to her gifts, culminating in one of my favourite Motown records, Helpless, in 1966. It’s hard to talk about this song without mentioning the Gladys Knight-shaped elephant in the room; Knight and the Pips’ stirring 1968 rendition was the first version I’d heard, so it’s interesting to come back and hear it at an earlier stage of development, to see Whitfield’s ultra-contemporary ’68 arrangement replaced (or, well, you know what I mean) by a storming early-Sixties girl group sound. It’s still a good song, although I think I’ve probably been spoiled by the Pips’ decidedly superior version. Of more concern is the record’s length – it’s almost indecently short, just nudging over the two-minute mark before fading out – which is a real surprise, when everything else Motown was releasing was seemingly geared towards the ultimate goal of achieving a “perfect” 2:30-3:00 pop single. This fades out so surprisingly early that I felt almost short-changed – I was just getting into that!. Maybe having already given it both barrels with her delivery, Kim just didn’t have anywhere else to take it. Possibly because of that abrupt fade and short playing time, this single wasn’t a hit – until DJs began flipping it over and playing the more forceful, bluesy B-side Love Me All The Way instead, sending the record up the charts as an unexpected first-time-out hit. This, though, is just about the stronger of the two sides. As well as striking chart gold via the Pips’ rendition, It Should Have Been Me was later a massive Top 5 hit in the UK, in a strange disco-inflected cover by Yvonne Fair – another powerful Motown singer underappreciated in the corridors of Hitsville – on the British Tamla Motown label. ” To Mickey Stevenson, Marvin’s romantic appeal and the Motown publicity that promoted it had made him the perfect instrument for furthering the career of Stevenson’s wife, Kim Weston. Stevenson saw his wife, a dark-skinned woman with a strong bluesy voice and a tendency to put on weight, as his Diana Ross. After putting so many hours into the care and feeding of Motown’s creative department, Stevenson viewed Weston’s stardom as his payback, the vehicle through which Motown’s well-oiled machine could make dollars for his pocket. Weston’s one significant hit, produced and written by H-D-H, was the uncharacteristically gospel-flavored ‘Take Me In Your Arms (Rock Me),’ which went to number 4 on the R&B chart in 1965. But it was her husband, with ‘Love Me All The Way,’ a Top Twenty R&B hit in 1963, ‘Helpless,’ number thirteen in 1966, and several other releases, who was providing the moving force behind Weston’s career. Despite Stevenson’s efforts, it was only her duets with Marvin, particularly ‘It Takes Two,’ a soulful mid-tempo dance song with a memorable vocal chorus written by Stevenson and Jobete staff songwriter Sylvia Moy, that captured the public’s imagination. I can’t recommend this book too highly, which was published in 1985, concentrating itself on Motown’s Detroit years only. I’ve mentioned it before in other comments and expect to again. It is worth any diligent hunt on amazon or eBay. Until someone writes a better one, I consider it The Bible. Take Me In Your Arms, Helpless, and It Takes Two, were the only Weston records I honestly knew in their own time, but my Motown oldies safari of the late 1970s brought I’m Still Loving You, Looking The Right Guy, Just Loving You, A Thrill A Moment, and the debut reviewed here. Weston’s HDH outings were in the years they could do no wrong, and probably eased introduction to Weston, and the Smokey record (Looking For The Right Guy) is just plain, delightful fun. But A Thrill A Moment was and is one of the best belated Motown surprises I could hope to find, the kind of song to really knock you back in your chair. By the time it ends, Weston has taken you to the stratosphere with her voice. What’s unfathomable is that the record didn’t even appear on Billboard’s R&B chart in 1965. Maybe I’m not the only one too who’s heard the story that Stevenson offered Dancing In The Street to Kim first who turned it down. That had to be a regret that didn’t go away too soon. His description of Kim Weston, as quoted above pretty much in its entirety, is one of the more controversial points of the book since its release (certainly it’s one of the things people seem to remember about it online!) Certainly I disagree quite strongly with his conclusions. First of all, the “dark-skinned and prone to put on weight” observation is both questionable, and neither here nor there (he’s similarly catty about Chris Clark IIRC), and while I’m well aware there were (and are) a lot of racist morons in America, the notion of them paying to see a soul singer like Kim only to be reduced to fits of laughter regarding the size of her arse seems highly unlikely – any photos and videos I’ve seen of Kim, she looks (a) fantastic, and (b) hardly out of the ordinary – certainly it’s hardly as though she was Sarah Baartman (I can’t help but think this is George reasserting his credentials as a black scholar – similar assertions about white men and black women’s physiques occur throughout the book). The stuff about Mickey Stevenson makes me raise an eyebrow, too; he bends the facts to fit the theory a little (including Stevenson-Weston collaborations that happened before they started dating, let alone before they married), and since even though she racked up a number of hit singles (including this first-time-out effort), Motown never managed to release an album on her (and since, as you mentioned, arguably her husband’s most enduring hit composition went to someone else – Martha Reeves has indulged in some good-natured ribbing of Kim over that), I’d love to know exactly what nepotism people were supposedly cross about. Finally, unless I’m remembering wrong, George doesn’t exactly rake Marvin Gaye over the coals in a similar fashion despite his relationship with Anna Gordy and his run of four flop singles (and an album) before “Stubborn Kind Of Fellow” – is it a gender thing? I don’t know. 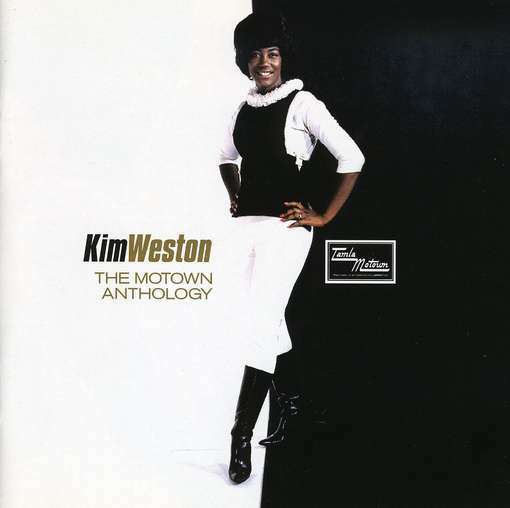 Anyway, I think Kim actually got a raw deal from Motown, and gets a raw deal in the book; her Motown Anthology CD, if anyone out there doesn’t have it, is a revelation and well worth picking up. That I would like to have seen! All of the photos in the aforementioned Motown Anthology CD booklet are highly flattering, but in particular there’s a variation on the cover shot (the cover itself, the oft-reprinted one of her in leggings and boots with the “black and white” theme – this one – isn’t exactly a bad shot either), apparently an out-take from the same session or something, used for the inner cover, and she looks incredible. Sadly I can’t find it online, but I honestly can’t imagine anyone’s reaction to seeing her being “chortle, this African-American lady has got a large bottom, tee hee hee, can’t take her seriously as an artist”, however much of a knuckle-dragging redneck troglodyte they might otherwise have been. Here’s some footage of her in 1965, wearing the exact dress George is talking about. Readers, you tell me what your reaction is. Mine is wow. This is a great song, by the way. Gladys Knight & the Pips also did a great version. I, too, was a little put-off by Mr. George’s remarks about Kim Weston. He acts like she was 300 pounds or something. She also looks very nice in any pictures I’ve seen of her. Yes, it is a good book, but here & there Mr. George throws in some very sarcastic comments which don’t make much sense. No disrespect to Mr. George intended. I should add that I heard the Gladys Knight version first. Didn’t hear Kim’s til many years later. GREAT WRITER! GREAT COMBO! MIKIM ROCKS! I liked this song when I bought it new in 1963,and I still like it a lot now. Kim did a good job on it. Also, she always looked very good to me. I have no idea what people are talking about, if they say she was “unattractive”. Certainly a strong stench of racism, the idea that a dark-skinned black woman cannot be attractive vis a vis a light-skinned one…..
…Also, I neglected to mention, in my previous reply to you, how much I enjoy your many comments and the expertise contained within them. Your contributions to this site have tremendously enhanced my knowledge of the Motown legacy and the entire R&B genre. Thank you for your kind comments. I enjoy the comments of all the knowledgeable people contributing to this site, including not only former Motown employees (like myself), Al Abrams and others, but also Motown singing artists, like Louvain Demps, Cornell Blakely, Fred Haney, Robert Dobyne and some others (I forget which, as we had many, many Motown people comment on Soulful Detroit Forum, and I forget where I have had cyber conversations with them). I can hear the Supremes on background vocals, too, especially Diana Ross. A rare and interesting combo: Kim Weston & The Supremes. Makes one think of alternate universes. Excellent song but thematically had been visited before. “Stop The Wedding” by Etta james released a year prior runs along the same line as well as “All I Can Do Is Cry” in 1960 contained two versions. One by Etta James and one by Joe Tex. There was also a “Don’t Stop The Wedding” by Pat Lundy in 1963 so that field was pretty well plowed. That said, i love this song. The length only adds to the “replayability” factor.